Over the last two articles I’ve been discussing the process of salvation. (What Is Salvation and Why Is It Needed? Also,The Importance of Repentance in the Process of Salvation). Because many confuse this subject, I want to use this article to clarify some issues. I want to make sure you know what it means to BELIEVE in Jesus. For starters, let’s answer the question, is salvation really a process? The answer to that question is both yes and no. Let’s begin with the NO. Salvation is NOT a process when we initially believe— it’s a BIRTH. This occurs when by faith we believe in the death and resurrection of Jesus Christ. Our belief causes God to instantly regenerate our fallen spirit and birth us into His Kingdom. This is a one time event and it is permanent. Some will ask, can you lose your salvation? The answer is NO. If salvation is a birth, can anyone be UNBORN? However it is possible to be STILLBORN. Being stillborn is often defined as fetal death after 20 weeks of gestation (Wikipedia). Jesus describes those who are spiritually stillborn in the Parable of the Sower. Others, like seed sown on rocky places, hear the word and at once receive it with joy. But since THEY HAVE NO ROOT,they last only a short time. When trouble or persecution comes because of the word, they quickly fall away (stillborn). Stillborn people HAVE NO ROOT. That’s because the believe in the WRONG THING. What are some of the things people believe that make them stillborn? They believe in Christ WITHOUT the cross. The cross is an instrument of death. They don’t understand that believing in Christ means that they must DIE to self. You see, Christianity is a substitutionary life. Christ substituted His life for ours when He died on the cross. God made Him to be sin for us who knew no sin (on the cross), so that we might be made the righteousness of God in Him. But in order to be made His righteousness, we have to die too! We must be willing to crucify our EGO and follow Him (Matthew 16:24-25). Our attitude should be one of repentance. People that “believe” in Jesus but don’t crucify their egos,haven’t understood the purpose of the cross— they aren’t born again. Like the Bible says, stillborn people have no root (Mark 4:16-17). They miss the point of what it means to believe in Jesus. As a result when hard times come, they fall away. See my article, The Emergent Church Deception. On the other hand, some people confuse denying themselves and doing good works as believing in Jesus. It’s not. People can deny themselves and do good works without ever believing in Jesus. Right? A person who believes in Jesus—FOLLOWS Jesus. Who do stillborn people follow? They follow the rules of others. They follow the Roman Catholic Church. They follow the Mormon church. They follow the Baptist Church. They follow the Methodist Church. They follow the Lutheran Church, etc. In doing so all of their works and self denials are done in aCOMPULSORY manner. What do I mean by compulsory? Compulsory means when you do something because you have to, or you are required to in order to go to heaven. For instance the Roman Catholic Church says that you must believe in the doctrines of the church in order to be saved. This is true of most religions. This is substituting Christ for the traditions of men. People that “believe” in Christ this way are stillborn. They really aren’t believing in Christ at all. They are believing in the rules of men with hopes that their good deeds and self denials will save them. 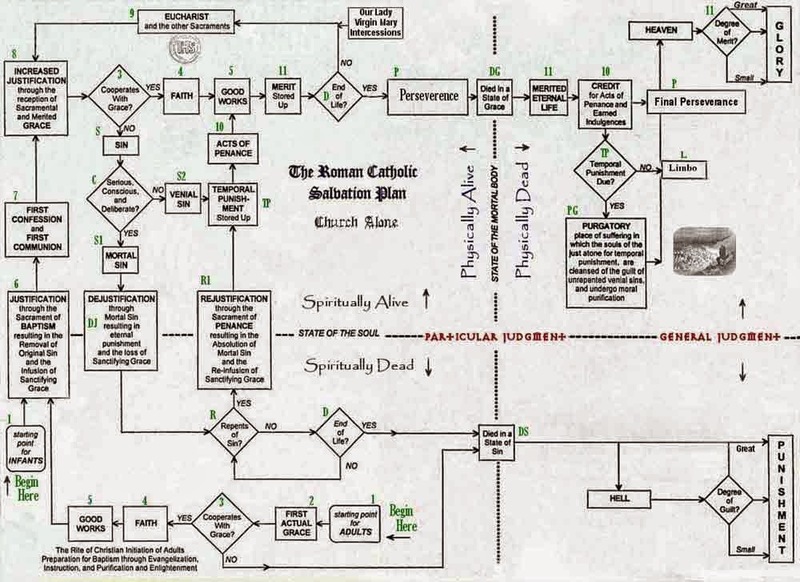 This is the Roman Catholic Plan of Salvation. Those that truly believe in Christ follow Him in a non-compulsory manner. Non-compulsory means that you do something because you want to. Your desire to do the “will of the Father” springs from a relationship with Jesus. Even so, living for Christ is NOT something we can do in our own strength. Why? Because just like Christ’s death,Christians live HIS life in a substitutionary manner as well. We have to learn HOW to let Christ live His life through us. Paul is talking about the substitutionary life of being a Christian. This is the part of salvation that is a process. It is also the topic of my next article, How Sanctification Works in the Life of a Christian. Here is a video that will provide you the basics of the true Gospel.